Lomber disc hernias (LDH) are one of the most basic illnesses that affect many people today. Surgical treatment is planned in patients who do not benefit from conservative treatment. One of the common complications after surgery is spinal infections. Spinal infections can affect disc spacing and vertebral body, and may create lumbar abscesses. Infection begins clinically with low back and back pain, then movement limitation, leg pain and fever are seen. We wanted to draw attention to the approach to spinal infections by presenting a patient who had undergone a lomber operation twice in our present circumstance and who was followed up for 2 years despite medical abcess and fistula formation. Shektman A, Granick M S, Solomon M P, et al. 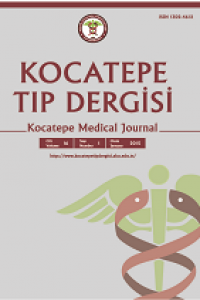 ; Management of infected laminectomy wounds. Neurosurgery 35:307-9, 1994. Hancı Murat, Omurga ve Omurga enfeksiyonları Temel Nöröşirurji Cilt 2 1337-1348,2010. Martín-Alonso J, Delgado-López PD, Castilla-Díez JM, MartínVelasco V, Galacho-Harriero AM, Ortega-Cubero S, ArausGaldós E, Rodríguez-Salazar A.Neurocirugia (Astur). 2018 Mar - Apr;29(2):64-78. doi: 10.1016/j.neucir.2017.09.001. Epub 2017 Oct 19. Spanish. Ogden AT, Kaiser MG. Single-stage debridement and instrumentation for pyogenic spinal infections. Neurosurg Focus 2004;17(6):E5. Hee HT, Majd ME, Holt RT, Pienkowski D. Better treatment of vertebral osteomyelitis using posterior stabilization and titanium mesh cages. J Spinal Disord Tech 2002;15(2):149–56. Boody BS, Jenkins TJ, Maslak J, Hsu WK, Patel AA. Vertebral Osteomyelitis and Spinal Epidural Abscess: An Evidencebased Review. J Spinal Disord Tech 2015;28(6):E316–27.